Quartz watches once nearly brought down the entire Swiss watch industry. Nowadays, they're just a convenient way to make watches slim, stylish and affordable – which is certainly not to say that they're all a load of cheap tut. Quartz watches are great, and we have some of the very best examples of quartz-kind here. The hands on a watch are moved by gears, which, in a quartz watch, are powered by electricity from a battery. But, without something there to regulate the flow of electricity, the gears would receive an endless current, which would mean they’d move continuously, rather than once per second. This is where the quartz crystal comes in. Quartz is piezoelectric. As you no doubt know, that means that if you pass an electric current through quartz, it’ll consistently vibrate the same number of times per second – 32768 to be precise. A tiny circuit in the watch counts the 32768 vibrations, then releases another electric current that moves the hands on your watch forward. Anyway, science aside, whether you’re planning on purchasing a snazzy watch for accessorising on a date night, or something more robust and businesslike for everyday wear, our list has just the thing. This beautiful Chanel watch subtly sends a serious style message. It’s a statement piece, with the intertwining steel of the strap reminiscent of a chain link bracelet. The strap is softened by the 56 cut diamonds which decorate the perimeter of the clock face. The detail in the face is subtle too, with just hands and no clock numbers giving it a minimalist appearance. If you’re looking to invest this much money in a watch, you may want to keep it as date night wear only, but made from stainless steel and waterproof to 30m, it’ll certainly make a stand as day wear. Made from stainless steel, this rose gold-hued watch is feminine, durable and suited to wearing day to day, while the stones around the bezel and the inside of the watch face also make it dressy enough for evening wear too. There are three miniature faces inside the watch face, including a 30 minute counter and 24 hour sub dial. Reviewers rave about the quality and appearance of the watch; it's a great buy. If you’re looking for sophistication and durability, this very attractive, premium piece is just the ticket. From Swiss watch maker Frédérique Constant, it's the perfect addition to your Swiss watch collection. Made from stainless steel, it’s durable and traditional enough for everyday wear, while the diamond detail extends its wearability to evening dress too. The elegant design is made subtly more feminine by the addition of a faint heart pattern on the watch face, although ironically the pricing is certainly not for the faint hearted. 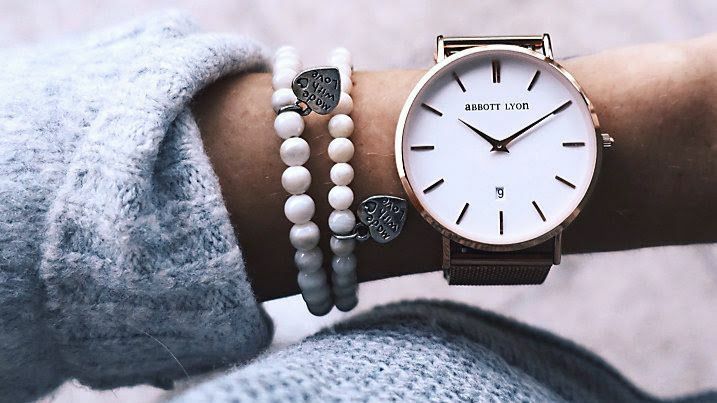 If you’re looking for a women’s watch large enough that you don’t have to squint when trying to read the time, the 40mm watch face on this Abbott Lyon piece should be big enough for you. Each of the indices is set clearly apart and there’s room for a date window, too. The strap is easily removable and can be replaced with a strap of another colour from the collection, so you can achieve the desired look for any given outfit or mood. Just because you go to work each day doesn’t mean your sense of style should slack. Rosefield designs marry function and fashion, and this watch blends classic colours – a navy blue strap and brass watch face – and modern detailing – a rope design – for a piece perfect for matching with smart office attire. The contrasting combination of the pink strap and black watch face make this a great choice for those looking for a standout piece. Feminine without being overly girly, it could be a good alternative to the Rosefield watch above, if you are looking for one that you can pair with your smart office attire. With the watch face made from stainless steel and a strong leather strap, it’s made to resist the wear and tear of the day to day, but still remains elegant thanks to the slim hands and hour markers. Taking inspiration from Sweden and London (hence Larsson & Jennings), the brand blends classic British style with the precision of Swedish design, creating a watch that is universal enough to dress down or dress up. The stainless steel face has been coated with 18-carat gold, and there’s also a plain steel one if you prefer silver accessories. The small face makes it perfect for women with slender wrists, while the classic design should make it appealing to all ages, so long as you aren't obsessed with the idea of watches always being round. Make the most of this hero material with our pick of the best wooden watches, including minimal faces and bracelet-style straps.